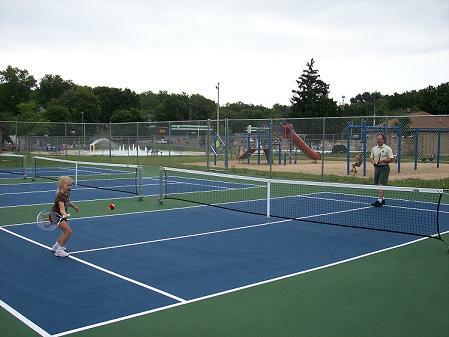 Milwaukee, WI---The Wisconsin Tennis Association announces Milwaukee as a recipient of a $100,000 matching grant for the 10 and Under National Target Market Initiative. The USTA grant of $50,000 will be matched by USTA/ Midwest Section and the Wisconsin Tennis Association. Greater Milwaukee, including Milwaukee, Ozaukee and Waukesha counties, was selected as one of 25 communities from throughout the United States, to implement and grow 10 and under tennis programming. With this grant, the Wisconsin Tennis Association and the Milwaukee Tennis and Education Foundation will administer youth tennis in partnership with the Milwaukee Public Schools, Boys and Girls Club of Greater Milwaukee, Park and Recreation Associations, CTA’s and local indoor tennis clubs. The USTA has developed the new 10 and Under Tennis and the junior tennis pathway to introduce youth to the sport of tennis using age appropriate equipment and court size. The program uses the QuickStart tennis format introduced by the USTA in 2008. Balls bounce lower and slower; racquets are sized for small hands; courts are smaller and easier to cover. The three year 10 and Under Tennis grant will provide skill development, informal competition, tennis in school and after school programs in four critical components: youth tennis pathway programming, teacher and coach training, installation of 36’ and 60’ courts and local participation and cooperation.